New research links football to CTE, a brain disease with devastating side effects. Imagine the game of football without tackling. Would you still watch? We’re guessing your answer was no. Tackling is at the heart of the sport. As the NFL coach Vince Lombardi put it, “football is not a contact sport, it’s a collision sport.” Whether we like to admit it or not, it is the violence of the game -- the tackles and sound of helmets colliding -- that we love. The violence and safety of the game have been called into question in recent years, as new long-term health effects linked to playing football have been discovered. Many are pushing for changes to be made to the game in order to reduce the number of football-related injuries and diseases. The new contact rule has proven to be difficult for players to adapt to during preseason. Officials called the helmet penalty 50 times in the first two weeks of the 2018 preseason alone. Players have been playing the sport with helmet contact for years, so making this change to a technique that has always been second nature will not happen overnight. Many critics of the rule fear that this will change the game of football forever. Programs like Heads Up Football put on by USA Football and youth leagues like Pop Warner emphasize safe tackling techniques to mitigate the game’s risk, starting at a young age. Pop Warner also limits the amount of time spent on contact during practice to reduce the number of injuries that occur outside of games. By teaching younger players how to tackle more safely, leading without their helmets will become a habit. This may make it easier for future generations of NFL players to comply with the new helmet contact rule, so the game might not change as drastically as we think. Because most safety concerns in football revolve around damage to the brain, the NFL has been working to improve the players’ helmets. In 2016, the league launched a campaign encouraging companies to reinvent the traditional helmet and make it safer. This campaign led to the development of the Zero1 helmet, created by a Seattle-based company called Vicis. Zero1 differs from other helmets, as the shell is lined with plastic columns that can shift or compress to absorb the brunt of the impact. The helmet also has a tighter fit than traditional helmets, which is meant to help keep the player’s head more stable. The NFL tests the different helmets worn by players in the league each year to determine which models are the safest. In both 2017 and 2018, the league named the Zero1 the safest helmet on the market. The helmet was used by more than 60 NFL and college players during the 2017 season. More teams at the professional, collegiate and high school levels have announced that they will be switching over to the Zero1 for the 2018 season. As a result of new helmet designs, the NFL announced in April that it would prohibit 10 older helmet designs that the league deems are unsafe. This is the first time that the NFL has ever banned specific helmets. Over 200 players will be impacted by the new ban, including Tom Brady, Drew Brees and Adrian Peterson, who all wore the older helmets in past seasons. Many players wearing the Zero1 have said that they don’t feel impacts as intensely and no longer experience headaches from tackling; however, there is no definitive proof that the helmet reduces concussions. Vicis even notes this fact in a YouTube video announcing the release of the new helmet. The experts agree with Johnson on this fact. Bennet Omalu, the doctor who discovered a brain disease linked to football called CTE, states that “there is no equipment that can prevent this kind of injury.” As long as the game exists, concussions will always be present. All that can be done is find ways to reduce the number and severity of these head injuries. So why have all of these changes occurred over the past few years? What sparked the public’s concern about the safety of football? The answer is CTE, or chronic traumatic encephalopathy. CTE is a brain disease that is believed to be caused by repetitive brain trauma. It was discovered in 2002 and is most commonly found in the brains of athletes and veterans. Former boxers, along with football, soccer and hockey players have all been diagnosed with CTE. 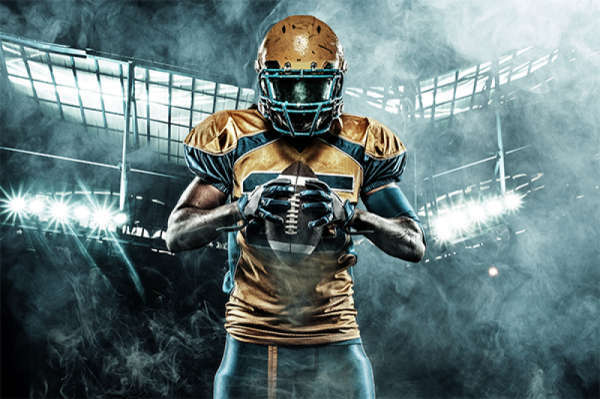 This disease is a major concern for football players, as the sport involves repeated blows to the head, with many players sustaining dozens of concussions throughout their careers. The symptoms of this disease typically don’t show up until years after the brain trauma, making it difficult to detect. Common symptoms include depression, confusion, paranoia, memory loss, changes in gait, and aggressive or suicidal behaviors. CTE is also often linked to other diseases like Alzheimer's and ALS (Lou Gehrig’s disease). Little is known about the disease. Its development in the brain, prevalence in the general population and treatment are all still unknown. Not only is there no cure for the disease, but it can’t be definitively diagnosed until a post-mortem examination of the brain. We have no idea what is going on inside a football player’s head until it’s too late. A study conducted by researchers at Boston University examined the brains of 202 deceased football players. The group included NFL, Canadian Football League, semi-professional, college, high school and youth players. Of those studied, the researchers found CTE present in 177 (or 88 percent) of the players. The most shocking group in the study were the NFL players: 110 of the 111 players studied from the league were diagnosed with CTE. It is important to note that the study did have its limitations. Most of the brains were donated by family members of players who suspected that they had suffered from the disease. Because the study used a convenience sample rather than a random one, the findings were skewed and do not represent the prevalence of CTE in the general population; however, it is clear that CTE is not a rare occurrence among football players. The discovery of CTE, the film “Concussion” (2015) and recent CTE studies have all generated a great deal of media coverage related to the safety of football. That coverage has lead to several events. Beginning in 2011, nearly 5,000 retired football players sued the NFL for concealing the long-term impacts of concussions. The league would go on to acknowledge the link between football and CTE in 2016. The number of high school football players in the US dropped by nearly 26,000 members from 2016 to 2017, despite an overall increase in high school sports participation. Karissa Niehoff, executive director of the NFHS (National Federation of State High School Associations), believes that the decrease is directly linked to safety concerns among parents. All of these occurrences beg the question: will people still want to play football now that we know the dangers of the game? As for the future of the game and the looming threat of CTE, Dr. Bennet Omalu says all we can do is hope for the development of some sort of medication that will prevent diseases like CTE. Chicago Tribune. “Diagnosing CTE -- And Football’s Future.” Chicago Tribune, 24 Nov. 2017. Daneshvar, Daniel H., Kiernan, Patrick T., and Mez, Jesse. “Clinicopathological Evaluation of Chronic Traumatic Encephalopathy in Players of American Football.” JAMA Journal, vol. 4, no. 318, 2017, pp. 360-370. Fainaru, Steve, and Fainaru-Wada, Mark. “SF’s Borland Quits Over Safety Issues.” ESPN, 17 Mar. 2015. Foley, Katherine E. “Football will Keep Killing Players Until we Change the Way it’s Played.” Quartz, 1 Feb. 2018. “Heads Up Football.” USA Football. Inc. "This is the Football Helmet of the Future." Inc. 2017. JPEG. Johnson, Billy. Personal interview. 23 Aug. 2018. Knoblauch, Austin. “NFL Expands Helmet-it Rule, Working on Targeting Rule.” NFL, 28 Mar. 2018. Lartey, Jamiles. “Concussion: Doctor who Fought NFL Says ‘no Equipment can Prevent’ Such Injuries.” The Guardian, 28 Dec. 2015. Maese, Rick. “Brain Study Examined 111 Former NFL Players. Only one didn’t have CTE.” Chicago Tribune, 25 July 2017. MacDonald, Brian. Personal interview. 22 Aug. 2018. Moran, Barbara. “CTE Found in 99 Percent of Former NFL Players Studied.” Boston University, 24 July 2017. “NFL Announces Expert Advisors to Guide Engineering Roadmap and Improve Equipment.” Play Smart Play Safe, 7 Oct. 2016. “Pop Warner Little Scholars.” Pop Warner. Rapp, Timothy. “Report Shows Continuing Drop in High School Football Players.” Bleacher Report, 7 Aug. 2017. Resnick, Brian. “What a Lifetime of Playing Football can do to the Human Brain.” Vox, 30 Apr. 2018. Shpigel, Ben. “Field Is ‘Perfect Place to Die,’ Rookie Says in Front of Roger Goodell.” New York Times, 31 July 2017. Terrell, Kevin. "Shonn Greene, Left, and Derek Cox in December. Players will be Penalized for Striking a Forcible Blow with the Crown of their Helmets." New York Times, 2012. JPEG. Thompson, Chris. “HIgh School Football Participation Drops for Second Year Straight.” Deadspin, 25 Aug. 2018. “Vicis Zero1 Unveil.” YouTube, uploaded by VICIS Pro, 11 Jan. 2016.